An accordion is a box-shaped instrument with free-reeds that vibrate the air from the bellow or slink structure in between the two handheld boxes. Popular instruments in pirate songs, toy accordions are smaller versions of the German-derived instrument. 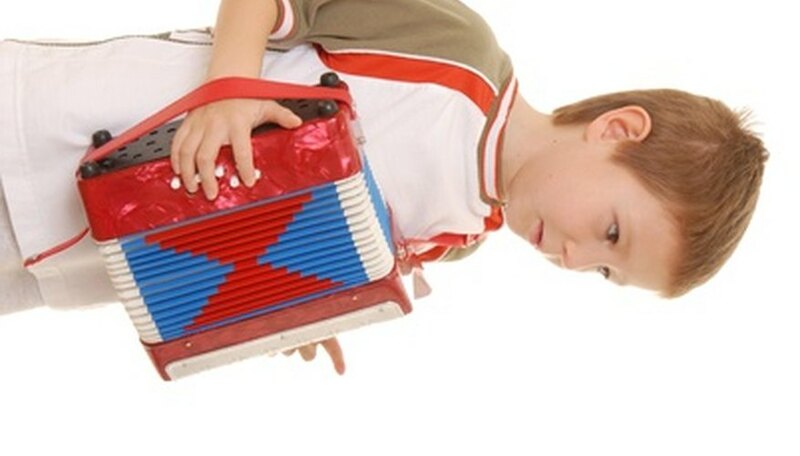 Toy accordions usually have seven buttons that play 14 notes and make musical gifts for children ages 3 and up. There are a few websites that sell toy accordions as well as music for songs playable on these smaller instruments. Using the buttons on the left and right, you can play melodies such as "Amazing Grace" or "Auld Lang Syne." Learn the parts of your toy accordion with the instruction manual. Thumbs go through the thumb loops on either side. To the right are a set of 7 buttons, while on the left there are three buttons. The buttons on the left are for bass, chords, and air valve, which has no sound. The slinky-like material in between is called the bellows. Undo the snaps on either side of the accordion and place your left hand underneath the left strap. Insert your right thumb into the loop of the other end of the accordion. The fingers of your right hand play the 7 buttons on the right, while your left hand's fingers play the three buttons on the left. Play melodies with your right hand. The two buttons on the left play harmonies. Use the air valve when you want to open and close the accordion without making any sound. Note the seven buttons on your right have corresponding notes. From the first to last, the scale goes from C, D, E, F, G, A, B. The accordion plays 14 notes in all. Play the C Major scale to start by pulling the accordion while pressing the first button with your right hand's index finger, then pushing the accordion together after holding a beat. Then, press the next button as you alternate slowly between pushing and pulling the accordion. Note that as you follow the scale, you change from push-pull actions after button 3 to pull-push action until the seventh button or note B. See resources for full diagram and instructions on playing C Major scale. Press "bass" and "harmonics" buttons with your left hand to add variations in your songs. Reading accordion sheet music shows how to use bass and harmonics along with the note buttons to improve upon the accordion's sounds. Follow toy accordion music by pressing one of the seven buttons on the right, then pushing the accordion together when the number is not in a circle and pulling when the number is in a circle. See references and resources for instructions with diagrams as well as different songs to play.